From the White House to Walmart – Neales…on wheels! We booked Cherry Hill Park in Maryland for its proximity to both downtown Washington DC and Annapolis, where my twin sister lives. Once we saw the attractive, shady, and spacious campground with two pools, two playgrounds, a splash pad, mini golf, a decent-sized pet area – plus a laundromat-grade laundry room, just steps from our campsite! – we decided to stay put through Labor Day weekend. Aside from the amenities, Cherry Hill was very well-run and maintained. They even had the ideal garbage disposal setup that all other campgrounds will now be measured against. The ideal campground garbage disposal situation: 1) bins large enough for household garbage bags 2) separate recycling bin 3) camouflaged by an attractive structure 4) conveniently placed throughout the park. “This is awesome!” And there was another pool right next to this one. Now that’s a laundry room. Our site, with the laundry room, cafe, and pools behind us. We managed to go to to the pool, and to Costco, after setting up. Then a full day of rain kept us inside and postponed our trip into DC, but the next day we drove to Annapolis as planned, with sunny and clear weather. I visited the city for the first time a couple years ago, and was absolutely charmed by the beautiful old buildings, gorgeous setting on the Chesapeake Bay, and incredible history and culture for such a small city. It was fun to get to walk around and take it all in again with my sister, Chris, and the kids. Enjoying Aunt Sheila’s walking tour of her great town. Our main stop was the Maryland State House, which is the oldest US state capitol in continuous legislative use, dating from 1772. Another fun fact: the State House is topped by the largest wooden dome constructed without nails in the US. Also, Annapolis was the actual capital of the United States from November 1783 until August 1784, and was a candidate to become the permanent capital before Washington DC was built. The main attraction for the kids was the Old Senate Chamber, where George Washington resigned as the commander in chief of the Continental Army on December 23, 1783. (Another piece of Hamilton come to life.) Just to illustrate how steeped in history Annapolis is, we had a drink on the porch of the Middleton Tavern from 1750, a place visited by George Washington, Thomas Jefferson, and Benjamin Franklin. View of the State House from Main Street. George Washington in the room where he resigned as commander in chief. While the kids stayed in Annapolis for a sleepover with Aunt Sheila, Chris and I got to enjoy a relaxing evening together, including pork chops cooked on the campsite grill. To prove how long it’s been since we’ve grilled, the charcoal we’ve been carrying around for who knows how long let off some weak gray smoke and then were done. I had to make a quick trip to the campground store for some firewood, but the end results were still delicious, and at least we didn’t have any hungry kids waiting for dinner. The kids didn’t quite get it, but it was really impressive to see these famous founding documents in person (even if they are barely legible). If you do go, be sure to explore the rest of the National Archives museum’s interesting and engaging exhibits, including Records of Rights , which showcases the ongoing struggle for Americans to define and protect the rights of those of us who were not included in the original Charters of Freedom. From the Archives we walked half a block to the National Mall and the kids got their first glimpse of this grand public space, with the Washington Monument flanked by the US Capitol and Lincoln Memorial at either end. 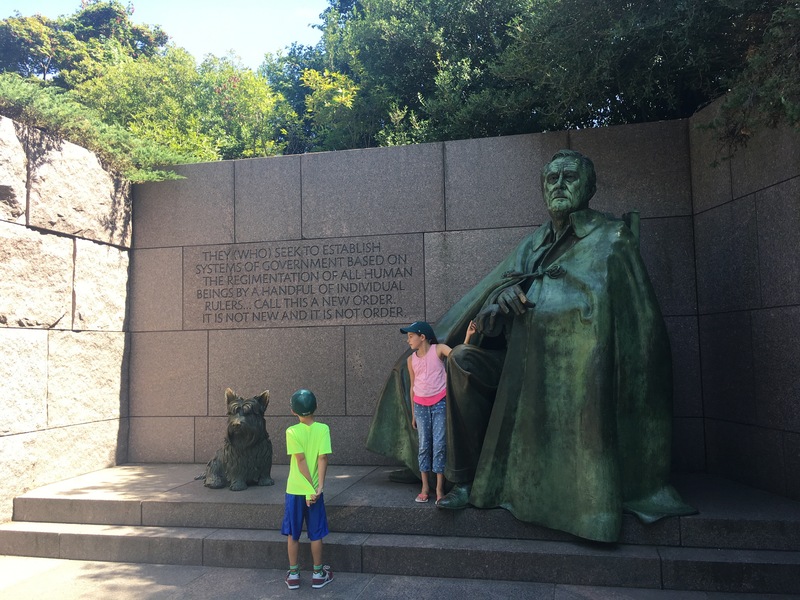 With limited time we didn’t even attempt to visit any of the incredible museums, but instead saw this as an easy overview for the kids’ first time in the capital, and an opportunity for them to earn a National Mall and Memorial Parks Junior Ranger badge. Our only mistake was not packing enough snacks, and expecting to find food vendors lining the Mall. We knew that the Washington Monument was closed for elevator repairs, but didn’t realize until we got there that there was no Visitor Center open either. There was a Ranger on site, and he managed to snag a couple Junior Ranger books from somewhere behind the boarded up entry way. We rested in the shade of the obelisk while the kids split the one granola bar I had in my backpack. Feeling refreshed after half a granola bar. At this point we had a choice: backtrack a bit to catch the Circulator bus down to the Lincoln Memorial. Or… we could walk. Even though I knew that the distances between monuments are further than they seem (kind of like the distances between casinos on the Las Vegas Strip), and even though it was hot and we were hungry, we pressed on. The kids were dragging as we hugged the shade around the World War II Memorial and the Reflecting Pool and made our way up the steps to the Lincoln Memorial. The newest addition to the Mall, the National Museum of African American History and Culture. Reflecting Pool at the base of the Lincoln Memorial, with the Washington Monument and US Capitol in the distance (and a couple of hot and hungry kids in the foreground). The shade and cool marble were a relief once we were inside, and Rita was especially thrilled to see Lincoln in person (even though she thought the huge statue would be even bigger, for some reason). And then, even though they were wandering around in a heat and hunger-induced daze, both kids sat on the floor and read through the entire Gettysburg address that’s inscribed on the wall of the South Chamber. For all that we missed in our few hours in DC, this moment made it worthwhile for me. Gettysburg Address in the South Chamber. Actually reading the Gettysburg Address. Despite the crowds out front, the side and back colonnades were peaceful, shady, and had incredible views. It was the perfect spot for the kids to sit and learn more about the events and people honored by the Monuments and Memorials, and then take the Junior Ranger pledge in this unforgettable setting. The steps around the sides of the Lincoln Memorial are a great place to relax. The back has views of the Potomac River, Arlington Memorial Bridge, and Jefferson Memorial. At this point, we were rested but still hot and hungry, and the kids wanted to see the White House before we headed back to the campground and the dogs. We walked through the somber and austerely beautiful Vietnam Veterans Memorial, then out of the Mall to Constitution Avenue. We quickly inhaled hot dogs from the first street vendor we found outside the National Academy of Sciences, then took a taxi to the White House Visitor Center, housed in the beautiful ground floor of the Department of Commerce Headquarters building. After going through a short but thorough security check we found an excellent museum with memorabilia, documents, and exhibits related to different aspects of the White House: as executive office; a family home; architecture and interiors; the evolving role of the First Lady; the White House staff. I especially enjoyed the personal recollections by former Presidents and their family members who lived there, and appreciated the perspective of the long and rich history of “The People’s House” as occupants come and go. The White House has its own Junior Ranger program, and we took the books with us to work on later and mail in for a badge. We saw parts of the actual White House exterior, but as we were walking toward the South Lawn the police started clearing the area. It was time to go home anyway. The excellent White House Visitor Center. The rest of our time in Maryland was spent visiting family nearby and enjoying the campground. It was great for the kids to get their first glimpse of our country’s capital and its famous monuments, and we’ll return again for more in-depth visits. With my Great-Uncle Ken and Great-Aunt Mary Lou, who I haven’t seen in many years. It was wonderful to get to spend time with them again with Rita, Charlie, and Sheila. We loved getting to connect with East Coast cousins (technically, these are my cousins), Quinn and Griffin. After seeing them in Southold we got to spend time with them again – and their parents! – in Virginia. Splash pad at Cherry Hill Park. Mini golf with Aunt Sheila at Cherry Hill. We got one more Memorial in with Aunt Sheila: Franklin D. Roosevelt. After spending Labor Day weekend in DC we put some miles between us and the East Coast, driving 270 miles to Wheeling, West Virginia and our first overnight in a Walmart parking lot. Not Cherry Hill Park, but it will do for one night. 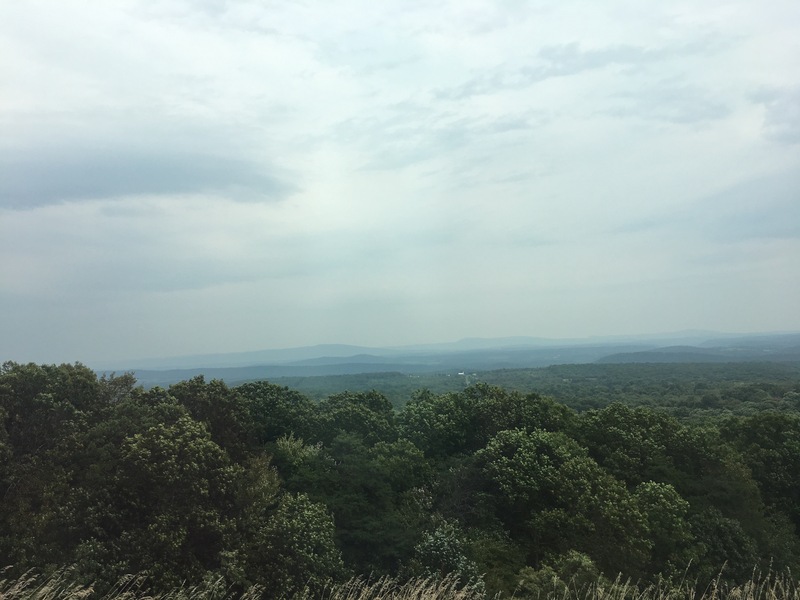 On a topographical map, the Appalachian Mountains look like a sweep of parallel ridges running southwest to northeast, and it felt like we were driving up and down every one of those ridges from east to west. There were no passes or switchbacks, and that steady up and down, relatively straight drive was unique compared to other mountain drives we’ve experienced. The pretty but long drive through the Appalachian Mountains. Wheeling was just an overnight pitstop, which is exactly when a Walmart parking lot comes in handy. In general, Walmart allows overnight parking for RVs, although you are supposed to check with each store to confirm (and to shop). The Walmart outside of Wheeling had spaces for trucks and RVs with several trucks parked – as well as several signs that made it clear that no overnight parking was allowed.A manager inside assured me that this only applied to trucks; customers with RVs are welcome to stay. So, we made ourselves comfortable between a couple of semi’s and settled in for the evening. No electric, water, or sewer hookups for one night isn’t a big deal; we had clean tanks, fresh water and could run our generator. What I didn’t really think about beforehand was how cramped the space would be without the slides out and only a narrow corridor in the living area. We’re used to that while we travel, but not when stationary. We had a deluxe dinner of fried chicken from Walmart, watched a couple movies, and called it a night. The next morning, after I walked to McDonald’s for breakfast and coffee, Chris found that the car battery had died. This is where the advantage of parking at a Walmart open 24/7 came into play! I went back into the store to ask if they had a portable battery pack, and a nice guy from the auto department came out to our car. Unfortunately the jump didn’t work and we still had to wait for AAA, but the auto department guy did follow up with a call to let us know they had our battery in stock. All in all it was an interesting experience, and a great option for free overnight camping if not the most comfortable one for us. Coming up: St Louis, Kansas City, and Lincoln, Nebraska as we continue our push West. 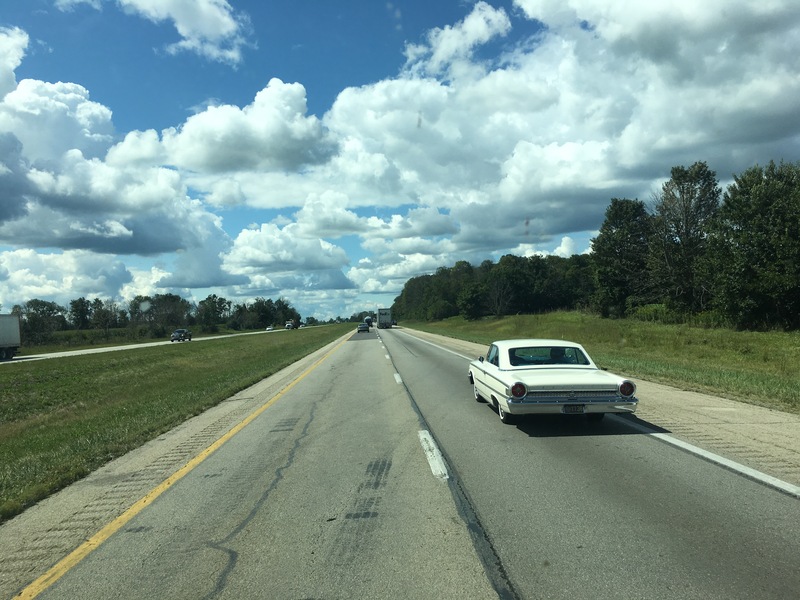 Pingback: Architecture, Fine Art, and BBQ in the Midwest – Neales…on wheels!